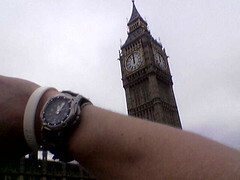 Posted byNic Price	 29 October 2005 18 October 2011 Leave a comment on Big Ben is wrong! It’s not often I witness this, so thought it worth writing about. I just cycled home from central London and checked my watch against the time on ‘Big Ben’ and noticed one of us was one hour out. I didn’t stick around to see if Big Ben has actually (been) stopped at 12 o’clock. I guess it’s something to do with the clocks going back tonight.